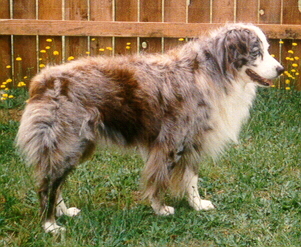 A linebred grandson of Ch. 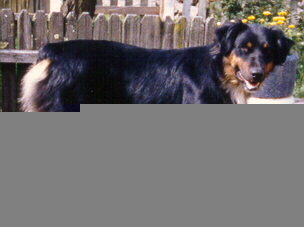 Chulo Rojo of Fairoaks, "Ranger" was one of our buddies from 6 months of age until his death at 12 1/2 years of age. He's the sire of Ch. Granada's Mad Max,CD and Granada's Molly MaGee,CD, grandsire of our "Libby", and great grandsire of our "Kipp", "Dixie", "Jet", and "Rowdy". Some companions from our past that are still very much missed!. A more intelligent, loyal dog would be hard to find! She was an avid tennis ball player until she finally slowed down at about 17 years of age. Shannon died 2 months before her 19th birthday! She was a part of our family for her entire life, and a great little companion. 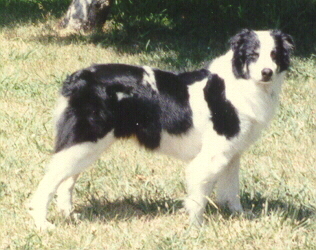 Shep was an "Aussie" of questionable background - possibly an Aussie/Border Collie mix. 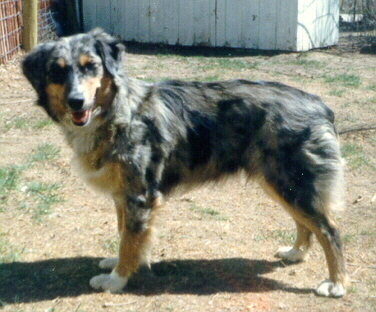 He was our first dog, and our introduction to the Australian Shepherd breed. He was very intelligent, loyal, and a super frisbee dog! We still miss him!